What conditions does Chantix treat? Tell your doctor right away if you have any serious side effects, including: burning feeling in feet/toes, unusual pain in the legs when walking. Stop taking varenicline and get medical help right away if you have any very serious side effects, including: seizure, symptoms of a heart attack (such as chest/jaw/left arm pain, shortness of breath, unusual sweating), signs of a stroke (such as weakness on one side of the body, trouble speaking, sudden vision changes, confusion), harmful behavior to self/others/property. List Chantix side effects by likelihood and severity. Before using this medication, tell your doctor or pharmacist your medical history, especially of: kidney disease, mental/mood disorders (such as schizophrenia, bipolar disorder, depression), heart/blood vessel disease (such as coronary artery disease, peripheral vascular disease, stroke), seizure. This drug may make you dizzy, drowsy, lose consciousness, or make it difficult to concentrate. Alcohol or marijuana can worsen these effects. Do not drive, use machinery, or do anything that needs alertness until you can do it safely. Talk to your doctor if you are using marijuana. What should I know regarding pregnancy, nursing and administering Chantix to children or the elderly? Does Chantix interact with other medications? Should I avoid certain foods while taking Chantix? 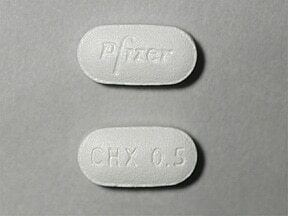 This medicine is a white, oblong, film-coated, tablet imprinted with "Pfizer" and "CHX 0.5". 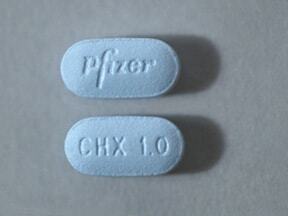 This medicine is a light blue, oblong, film-coated, tablet imprinted with "Pfizer" and "CHX 1.0". Are you considering switching to Chantix? How long have you been taking Chantix?